DTS-C can measure virtually any parameter important to the CATV industry. Controlled completely through the (GPIB) IEEE-488 bus interface, a Model DTS allows rapid, repetitive, and objective readings in a production-type environment. This combination permits enhanced distortion measurements. Cross-modulation, Discrete Second Order and Discrete Third Order measurements can be made down to -120 dB. Composite Second Order Beat measurements can be made down to -100 dB. All measurements and evaluations are under external computer control, allowing test procedures to be changed as easily as loading another computer program. 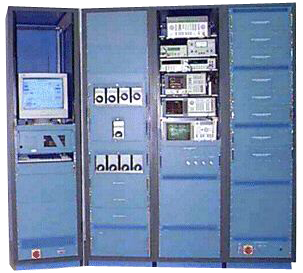 Test configurations are controlled by the host computer, permitting tests to be performed, in any order, without human intervention or manual circuit reconfiguration. Easily-written customer programs can quickly sort previously-untested units into parameter-dependent categories. Specifications and parameter limits can be changed at any time. Permits 100% testing of all parameters in a production-type environment in virtually the same time normally required for spot-testing using traditional testing methods. Optional equipment includes remotely-controlled frequency counter, power meter, power supply, multimeter, calibrated noise source, and frequency synthesizer. Semi-custom software is available from Matrix which controls all Model DTS testing automatically. This software is compatible with most Basic language computers and can be easily modified by the user as test requirements change. 1) Measure the gain at several frequencies. From this determine gain, flatness, and slope. 2) Measure input and output return losses. 6) Measure Discrete Second Order. 7) Measure Discrete Third Order. 9) Perform final classification of unit under test. Display results. After each of the above tests, the program would check for (and reject) any "out of spec" conditions. If "unit under test" failed, the testing on it would terminate, thus saving valuable production testing time. The reason for failure would be displayed, thereby providing useful engineering information on causes of failure. Although the exact time required for testing will vary with the number of tests required, a carefully designed routine would allow 100% testing of all parameters.